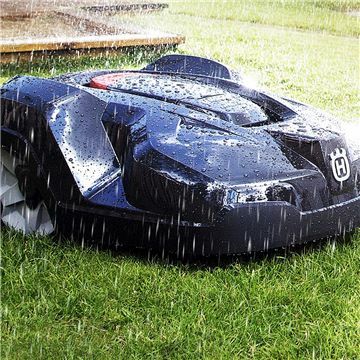 Large size robotic lawn mower equipped with GPS navigation for more efficient mowing of demanding lawn areas. Suitable for larger areas up to 0.8 acre (34,000 sq. ft.). Can handle steep slopes with an incline of as much as 45%. Smart technology adapts the amount of mowing to the lawn’s growth rate, which enables spot mowing for area of longer grass, and guides the mower through narrow passages. The intuitive menu on the large, user-friendly display allows personal settings for when you'd like the machine to mow. Automower® Connect brings the robotic mower’s menu system to your smartphone, making it easy to read and change the mower settings remotely. RELIABILITY: Robotic lawn mowing is all about reliability. Husqvarna has during 20 years of development refined its mower concept to achieve the highest level of reliability, quality and cutting result, with a minimum of assistance. EXCELLENT CUTTING RESULT: Thanks to the free movement pattern of Husqvarna Automower® the lawn is perfectly cut, achieving a beautiful and carpet-like look. The razor-sharp blades cut the grass gently from all directions, helping it to grow strong. Moss growth is effectively prevented. GPS-ASSISTED NAVIGATION: An onboard GPS system creates a map of the garden, including where the boundary and guide wires are installed. Husqvarna Automower® will then register which parts of the garden it has covered and adjusts its mowing pattern accordingly. This will ensure optimized lawn coverage and an excellent cutting result. WEATHER TIMER: Adjusts the working time to the lawn’s growth rate, meaning that Husqvarna Automower® will maximize its mowing time during periods of strong grass growth. In sunny or dry weather, or late in the season, the mower will spend less time mowing, which decreases wear on lawn and mower. LOW NOISE: Thanks to its unique cutting system, Automower® works extremely discreet and quiet and just when you want. PIN CODE LOCK: Automower® is equipped with an effective PIN code system, which largely increase the protection of the mower. SETTINGS PANEL: With the settings panel the mower can be programmed to fit many different lawns and preferences. AUTOMATIC PASSAGE HANDLING: Husqvarna Automower® automatically senses narrow passages and finds its way even through the smallest passages. It will vary its route through the passage to avoid unpleasant tracks. ELECTRIC HEIGHT ADJUSTMENT: The cutting height is swiftly adjusted by the electrically operated height adjustment, easily accessible from the main menu. DUAL GUIDE WIRES: Our top-of-the-line products are equipped with dual guide wires, which reduce searching times especially for complex lawns. AUTOMATIC CHARGING: When Automower® needs more power, it finds its own way back to the charging station. NO EMISSIONS: Because it is electrically powered, Automower® produces no harmful emissions. 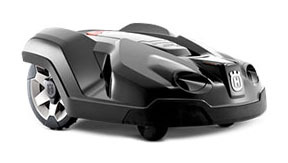 TIMER: You decide if you want Automower® to mow the lawn around the clock and 7 days a week. WEATHER PROOF: Automower® can be outside around the clock and is designed to function properly and unattended regardless of the weather conditions. Automower® is built to withstand the harsh Nordic climate without any problems. MANAGES SLOPES UP TO 45%: Large course-treaded wheels provide excellent traction even if the surface is slippery. The mower handles slopes up to 45%. 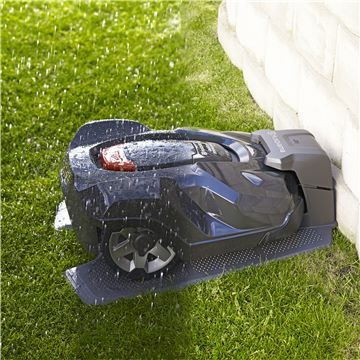 UNIQUE CUTTING SYSTEM: Husqvarna Automower® cuts just a little but frequently, which assures a nice and healthy lawn. It is equipped with sharp razor-like blades made of strong carbon steel mounted on a robust cutting disc system. This provides for efficient operation and extremely low energy consumption. ANTI-THEFT ALARM: The anti-theft alarm offers maximum security to the mower, activated according to your own choice. 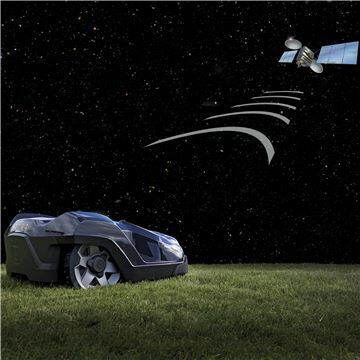 LOW ENERGY CONSUMPTION: Efficient energy management means low energy consumption, allowing Automower® to operate at a fraction of the cost of conventional lawnmowers. SPOT CUTTING: Special mode to quickly mow a limited area of longer grass. This is especially useful for areas beneath for example garden furniture, once the furniture is removed. Place the mower in the desired area and choose Spot cutting mode. The mower will mow in tight spirals and when finished resume in automatic mode. LIFT & TILT SENSORS: If Automower® is lifted off the ground or tips over, the cutting automatically shuts off. In addition, the blades are rotating far from the outer edge of the machine. If Automower® meets an obstacle it will stop and redirect itself without causing any damage.